As you can see the dpph is lower this week than the last two weeks, but still significantly higher than the first four weeks of the season. And the monarchs that have chosen to stick around are turning into fat & happy monarchs. (Can a monarch be a 'butterball'?) If you came to our demo you may have heard us mention butterfly gardens and nectar plants for monarchs (and other butterflies). Right now these gardens are producing quality nectar blossoms of Aster, Jerusalem Artichoke, Butterfly Bush, Cosmos, Zinnia and Marigold. The last few days have evidently proven profitable for our monarchs because just about every monarch I tagged today was FAT, either a 4 or 5 or 5+ on our scale of 1-5 for fat content ("1" being skinny and "5" being fat). This monarch was so fat, I gave it a "5+"
This fat content stored in their abdomens is very important for the Monarch. It uses the fat as stored energy to aid itself on it's 2000-3000 mile journey to Mexico. When the fat reserves get low, the monarch must stop and find nectar to replenish it's fat stores. Without nectar plants along the monarch's route to its over-wintering destination, the monarch would starve to death. One of the ways you can support the monarch migration is by planting your own butterfly garden, filled with nectar sources for hungry butterflies. 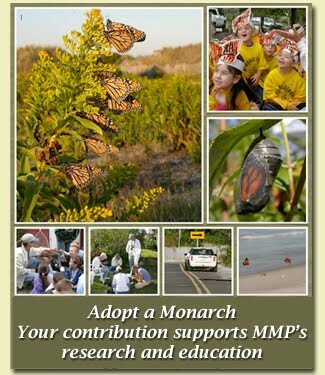 The residents of Cape May Point have contributed greatly to the success of the monarch migration here in Cape May by planting and maintaining these nectar plants for the monarchs. Click the link for more information on how you can start your own backyard garden for butterflies. Not all monarchs emerge from the chrysalis in a pristine manner. If something happens during eclosion and they are not able to full extend their wings to dry, they can become crippled, like this butterfly. This male monarch is able to fly, but his hindwings are obviously curling at the base. Though this may be due to some disease or parasite, more likely it is a result of the monarch not properly emerging from its pupa. One thing we would like to know is if a monarch like this one will make it all the way to Mexico. This larva was reared in our tank at the CMBO. Unfortunately, it has contracted a disease and when it tried to pupate, it died. The result is a partial pupation, which starts at the head. You can see the green lump behind the caterpillar's eyes. That is the emerging chrysalis. The caterpillar has actually begun to split it's skin at the head, which is indicated by its limp antennae, and the split down the front of the face. It died like this, and while it is sad because it will not become an adult monarch, I find this is still an amazing tribute to how complex monarch biology truly is. The metamorphosis process is still like magic to me, and a glimpse into this magic process is AWESOME! This caterpillar may look similar to a monarch larva, but in reality is the larva of a sphinx moth. This was found by the hawkwatch last friday. It got stomped on, sorry to say, but I rarely get to see these caterpillars. My newly purchased "Caterpillars of Eastern North America" guide (that I got at the CMBO) suggests that this little guy is actually a Snowberry Clearwing. The adult moths are commonly referred to as "hummingbird moths". They fly just like humming birds, and even have the body shape of a hummingbird, but are smaller, and are not birds at all!! I've seen a couple of these while in Cape May. You have to have quick eyes to see it and even quicker reflexes to photograph it! LAST but not LEAST, I leave you with my photo of the week! I was hunting monarchs on Coral Ave, and this thing sped by me like brown lightning. Who IS this mysterious little lepidoptera? I knew instantly that it was NOT anything that I'd seen round these parts before. I cursed at it as I ran for my camera, which was conveniently in the car. I hoped it would stick around long enough for my return. And I cursed at myself for being such a butterfly freak that I was going to be late for my monarch census! I found it again. I waited patiently for it to settle down, and carefully stalked my flighty brown prey. Despite it's elusive manner I managed one poor photo before it took off. This brief encounter was enough to deduce it's true identity: a Horace's Duskywing! A butterfly I've never seen before! Northwest winds predicted for this weekend. So keep your eyes on the skies, and your hopes high for one last monarch migration through Cape May!